You could, theoretically, spend all your time on campus, because it has everything you need: a supermarket, library, restaurants, a club etc., but I do love spending time in town as well. 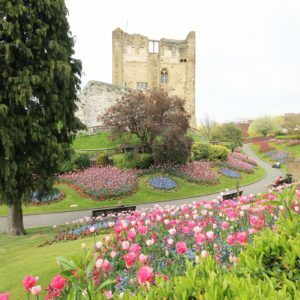 Guildford has so much to offer and the town centre is only a ten-minute walk away from the main university campus. Whenever family or friends come to visit, I give them a tour around town, so I wanted to share some of my favourite spots with you! Guildford has a small castle, from where you have a great view of the town and the cathedral in the distance. In the summer the grounds are filled with flowers, which make it so picturesque! There are many nice cafes, two of my favourites being Harris + Hoole (http://www.harrisandhoole.co.uk/) and the tea terrace, which is a cute English tearoom (http://www.theteaterrace.com/). 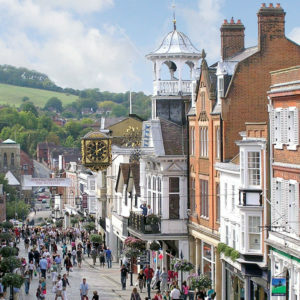 Guildford is great for shopping, as it has a good selection of big brand shops such as Zara, Topshop and H&M, which you can find on the High Street and the Friary shopping centre; but it also has also a number of smaller boutiques where you can find really unique pieces. Guildford also has a great variety of pubs and bars, as well as a few clubs. One place I absolutely love is the mount, which is part of a narrow elongated ridge. 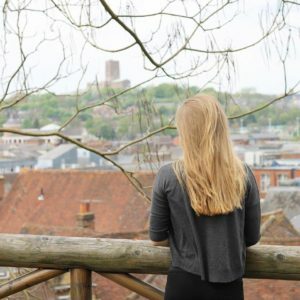 Once you managed to climb up the hill or the streets leading up to it, you have a great view of Guildford (and London in the distance) on one side and the countryside on the other! And last but not least, Lewis Carroll, the author of Alice’s Adventures in Wonderland (one of the best children’s books of all time if you ask me) spent much of his life in Guildford, so there are a few statues of Alice around town.